‘My first time’ is a pop culture cliché, of multiple applications – the first taste of alcohol, the first time you really got into an LP you bought yourself, the first time you went on a date, the first time you leaned in for a kiss… The conventions of bad TV and lazy newspaper columns would have it that we always remember these moments, enshrine them in our memories, supplicate before them. Frankly, besides the last of these, most of the above moments are pretty fuzzy for me now, or have been somewhat gussied up in my personal historical record; for example, I’d dearly like to think that the first album I sold my soul to was Talking Heads’ Sand in the Vaseline. I strongly suspect that it was actually Chris Rea’s Auberge. That terrible revelation aside, I am much clearer on my first time as a ‘dialectographer’. Not hard really; for one, it was only about 6 years ago, and two – the term dialectographer is something I blatantly made up. 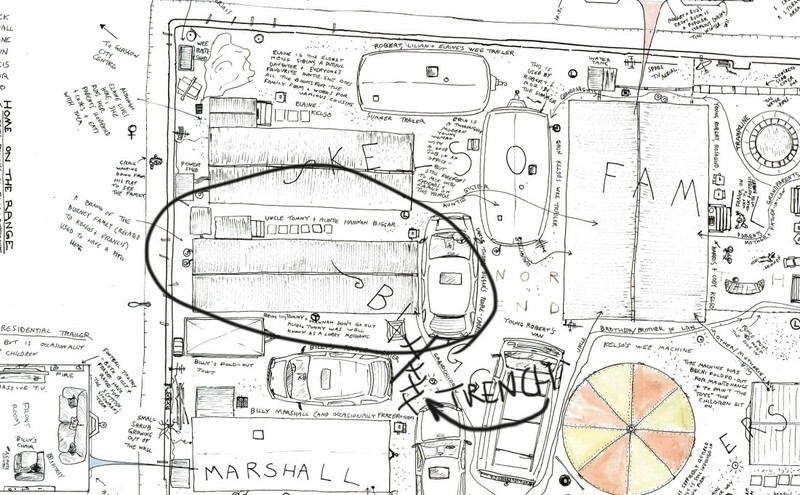 So for the record – my ‘first time’ as a dialectographer could probably be pinpointed as a cold day in January 2009, when I finally solidified years of notes, impressions and thoughts about my family’s Showman’s yard in Glasgow into a drawing I called Travellerology. For a number of reasons, this first, or ‘proto-dialectogram’ does not get shown online or publicly anymore. It’s a ‘first time’ that will remain largely private (and as embarrassing as any first fumble in the dark will be). Instead, there is A Showman’s Yard in the East End, a 2012 re-working of this earlier piece, using carefully chosen pseudonyms and in a radical departure, colour. It showed in even greater detail, the way in which a group of travelling showpeople organised their living arrangements and created a place in the most unpromising of locations – the shell of an industrial facility in Glasgow. A Showman’s Yard is thus, very much a dialectogram about me – or rather, my past. The yard it shows may be VERY similar to the yard where my nearest and dearest still live. And now, it is very similar to the yard where I, and my very nearest and dearest (my wife) are going to live (again, in my case). After 14 years of tenement life in Dennistoun, we’re shifting, somewhat full circle, to a very comfortable mobile ‘chalet’ unit of the type so many Showpeople now live in. Coming soon to a corner of a yard very like this: us. You can get them relatively cheap, they MOVE when you need them to, but largely act and behave like your average house. This means moving them is a bit more difficult than your average caravan. There is the de-stabilising process – taking out the jacks and blocks, preparing it for the trip, then the re-stablising or ‘setting process’. 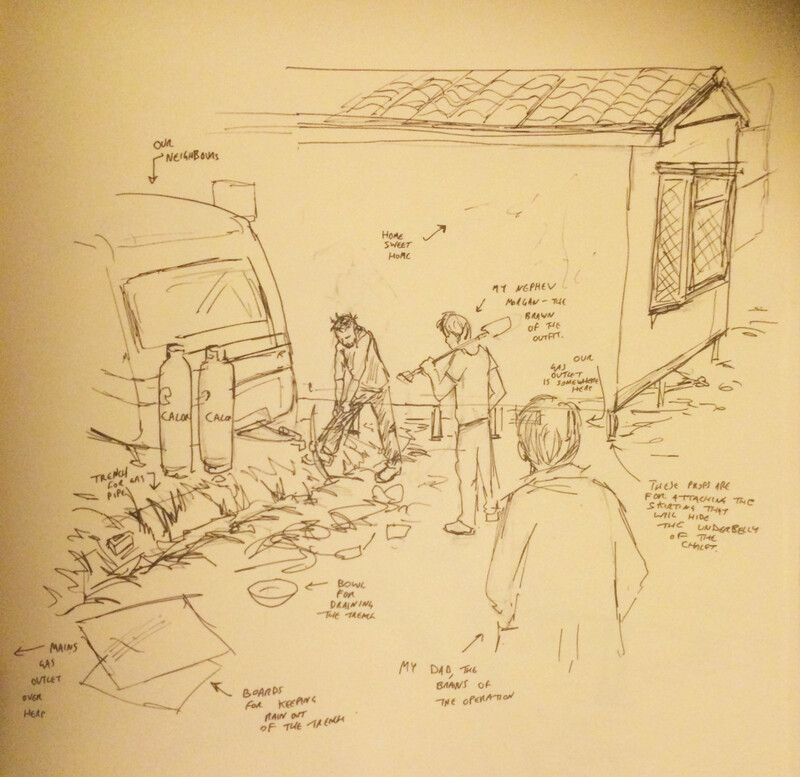 Then the mundane but important stuff that needs sorting out, such as drainage, water, electricity and gas supply (and that’s even before we get to the work needing done inside the bloody thing…). All art is trickery; perspective trick you into a sense of depth; colour into one of light, emotion, feeling; the stretched tendons Bernini sculpted into his marble figures of flesh, blood bone and sinew moving under the surface of its ‘skin’. In their own much more minor fashion, dialectograms trick us with the notion they contain…everything. They don’t. Take a dialectogram apart, and you will find that its arrangement of text, line and occasional colour is actually very selective, its intricacy and mess creates an idea of comprehensiveness sufficient to convince you that you are seeing life in the round. What we are seeing is a layer of life as it can be captured in line and text. Take a look at A Showman’s Yard (and please click the link and do so – it will open in a separate window) and you can engage with the narrative, social, architectural and to a limited extent, material nature of the yard. What is does not really do, is engage with the land itself – what the wagons and trailer sit on. It stays on its surface. But as I’ve been digging a trench for a new gas pipe (see below) I’ve been consequently, taking a much closer look at what makes the yard what it is as a physical thing. By ‘look’, I largely mean the brute work of digging; pick away at the dirt, clear the debris, swing again, rinse, repeat. Bit by bit, bite by bite. 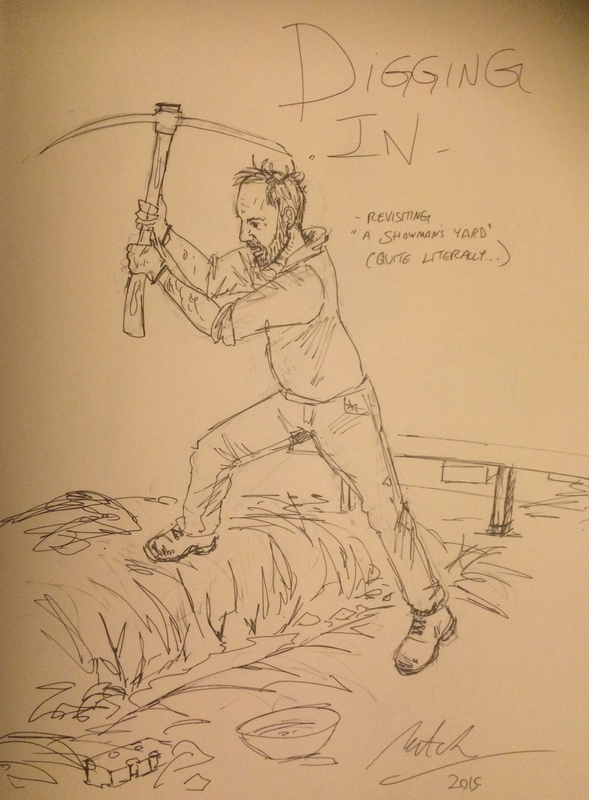 It’s fieldwork of a sort – is this what anthropologists such as Tim Ingold mean when they advocate getting to grips with, and working through the materials of a site? As I type this, the black dirt of Parkhead still stubbornly nestles under my fingernails and even my fingers are stiff (that’s my excuse for the quality of these drawings and by jingo, I’m sticking with it!). I reckon the materials are certainly getting to grips with me. We had to cut through not just earth, but three courses of bricks and cobbles. When our families first came to this site some 18 years ago, the ground was very uneven and sloped from one end to the other. My uncle explained to me that he and my father re-purposed the bricks from the partially demolished foundry walls that encircle the site. They laid them out over the original cobbles in increasingly deeper courses to level the ground out and make it fit for the vehicles to come on. It was this layer we were biting through to make our own living here. With such tough bones, the ground certainly bit back– we broke two picks and a small stake hammer (of many years loyal service) trying to get through the second and third layers. It was around this point that the trench digging became somewhat archaeological. 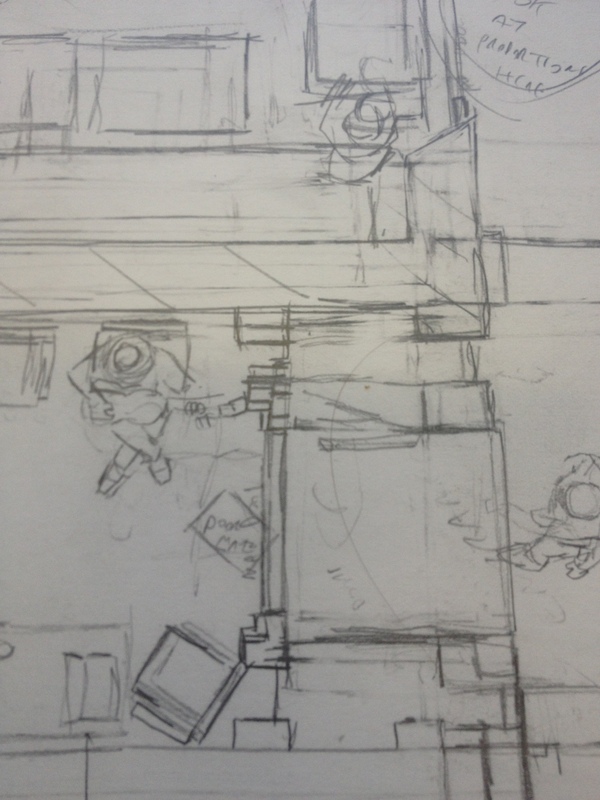 As I mentioned the yard was once a steel foundry – check out the top left quarter of the drawing and you’ll find how I dealt with this in the dialectogram. 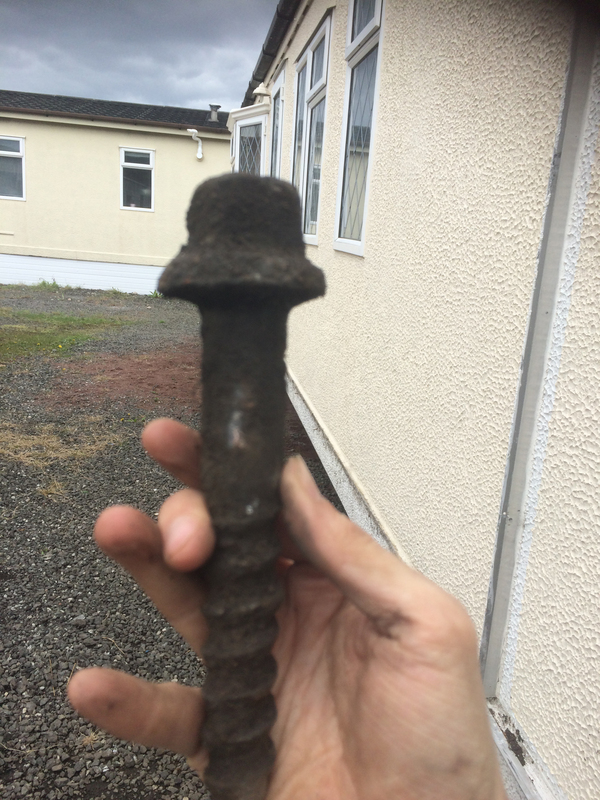 It was in much the same area of the actual yard that I made much more physical contact with these origins – such as this gigantic screw, a plate cover for some industrial fixture and large, thick steel springs. And then, more dramatically, as we started to get a good foot or more down, we knocked against what seemed to be a very large stone. Chipping around, we gradually unearthed a gas canister, heavily encrusted with hard packed earth and rust. If our pick had hit it dead on, I wouldn’t be so sore right now. In fact, I wouldn’t be anything anymore. Such finds are hardly surprising in a post-industrial city like Glasgow, where what lies beneath is not always a question you want answered. Still, alarming as it was, I came away from this brutish, layman’s archaeology with a better sense of what my turf was made of (answer: not a lot of actual turf). Archaeology is an interest of mine I hope to pursue much more closely later in the year – Orkney is looming large in my plans. Even at centrepiece sites such as the Ness of Beodgar complex, archaeology is still founded on digging trenches- picking through layers of landscape and trying to read it. From what archaeologists such as Ingrid Shearer and Kenny Brophy have told me, this is not a neat or clear-cut process, but one of trying to perceive changes in colour and texture, getting the best impression you can. They also told me that the dialectogram conveys exactly the sort of knowledge they are trying to reconstruct from gravel layers and potsherds. 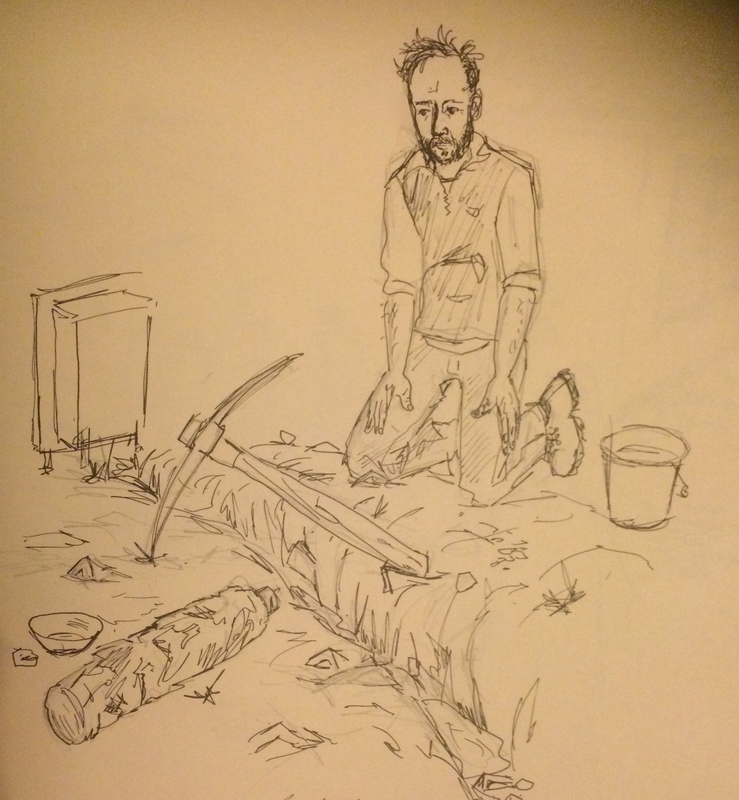 Someone like Kenny, whose period is the Neolithic, will probably never obtain the degree of narrative context found in A Showman’s Yard – he can only produce what he terms the most plausible fictions he can, in order to make the stones and post-holes speak. Imagine it’s 3015, and you find a Crown Derby plate like that depicted in the mid-right of A Showman’s Yard, in the context of what seems to be a factory. Was this a porcelain factory? Is this where Crown Derby came from? Was this a site used by master-ceramicists? And how would these future archaeologists explain the courses of bricks laid out against the slope of the land? Would they know that these had been laid by cousins, sons and uncles, and what for? Was this a shoogly foundation for a ceramics factory built over a steel foundry? In a sense, I am in the fortunate position of being able to preempt the needs of such future archaeologists. 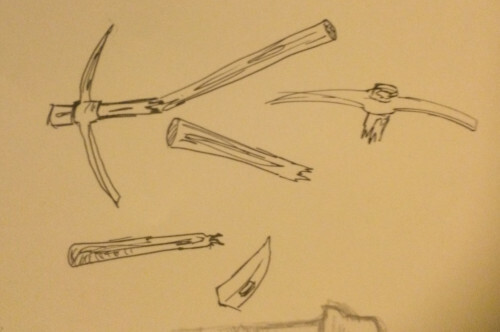 Imagine if Kenny found a dialectogram chipped into stone at Skara Brae, telling him who lived there, what the ‘dressers’ were used for, what the people called themselves – and what happened the time the hearth fire got out of control. Would that make his job easier? Would it just add confusion, if there were lots of cultural and political references he had no background? Would it even take the fun out of it? If I did redraw A Showman’s Yard I think I would maybe do a little more to make the stones – or perhaps the bricks – speak out than they do at present. Maybe I’d go down just one more layer into the archaeological mysteries that everyday life here is built on, incorporate it into my depiction. And then maybe I’d give that depiction back to the site and bury a non-perishable version of A Showman’s Yard somewhere near our new gas pipe, inscribed on stone or resin so it had a chance of speaking to the future – if our future archaeologist’s trench went over the right spot. 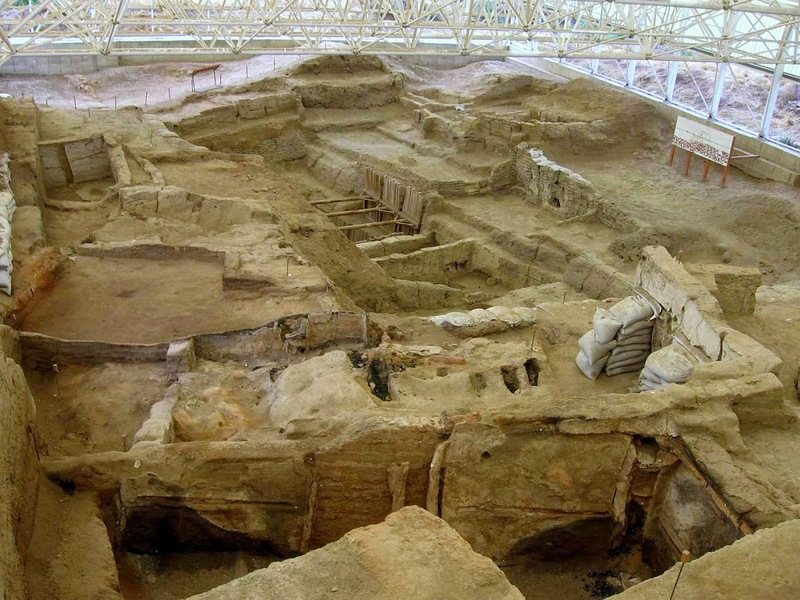 This makes me think of this image, a mural discovered at the Turkish site of Çatalhöyük, a remarkably well-preserved 9,500 year-old urban settlement excavated in Turkey. It is believed that this is a map of the settlement (compare it here, to the archaeologists’ map of what this place probably looked like). The ‘map’ shows Çatalhöyük laid out as if from above. This would be a view familiar to the occupants, who did most of their everyday business on the rooftops of their mudbrick houses. In the top of what is catalogued as the Çatalhöyük Level VII mural, you can see what seems to be an elevation of the Mount Hasan volcano that dominated their horizon. This volcano was important to them because it was a source of obsidian for tool-making and trade. Its by-product was a critical component in their society. It’s tempting to see in this mixing of elevation plan and bird’s eye view, spatial representation and deeper social information, something of a dialectogram. I think it’s what you call confirmation bias! But I do think there’s a shared purpose here – a shared concern to capture the passing event, the small detail, the connections between people and things that dirt and stone do not record on their own account. It’s what the dialectogram seems to be about, and probably always was. SUPPORT YET MORE OF THIS POINTLESS WITTERING! So, here’s the bit where I get a bit awkward as I introduce my Patreon Campaign. Dialectograms are the main way I try to make a living – while I will try to fill in the financial gaps with part time work and exploiting every possible string in my bow, they take up a lot of my professional and personal life. Works such as A Showman’s Yard, or an Overview of the Red Road Flats are not particularly ‘commercial’ – they are laborious, time consuming, difficult to distribute and take a long time to turn around. I’ve been fortunate enough to attract project funds that keep me alive. But the gaps between projects can be long, and the shortfall between fee and actual time taken steep. And then there are the potential projects where there is no funder or commissioner to support the work a dialectogram takes – think of things like The Free Hetherington (pictured) , a dialectogram I have slotted in between project gigs that, given the contentious politics would ever support. I’d like to be more able to take on worthwhile subjects in the hidden corners of our cities, largely unseen yet as interesting and fascinating as the likes of Meadowbank Stadium. It is after all, where the dialectogram started. Now this is something I am generally philosophical; I chose to be an artist and in this world we live in, it is a precarious profession. Still, there is a difference between precarity and falling headlong into the abyss. I have been looking at alternative options that might help me meet at least some of my basic costs (such as my study) so that I can continue to do this work, take on more off-piste commissions, and generally, keep what’s left of my hairline. Oh, and keep much of my content free and accessible, such as the material I share on this site. So, I’m going to give Patreon a try. This is a crowd-funding initiative based not on fundraising for big projects (like Kickstarter), but on small payments for content created on a regular basis – long, continuous trickles of creativity rather than the big tentpole productions. In Patreon, supporters can set a recurring charge on a monthly basis that pays me a little bit – as little as where, whenever I make new content, they pay some small amount – as little as about £1, depending on exchange rate – with lots of safeguards and the option to pull out (and re-join) whenever suits you. Under this scheme, I would still make what a lot of free content – possibly more, in fact. Whereas Kickstarter and Indiegogo offer perks in exchange for support, Patreon is based on the idea of supporting an ongoing creative process (and being able to take part in an ongoing conversation on what dialectograms and the type of illustration it represents, can be. Nevertheless, gratitude is a deep well and patrons can expect early peeks at the work I’m doing, and an annual thank you for their support. The page I’ve made up explains this all pretty well, so please take a look. If you have any further questions you’d like answered before you click the pledge button, I’ll happily answer them! Thanks for your time.